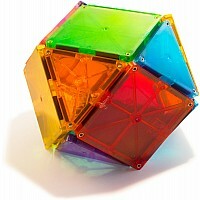 Magna-Tiles® diamond and pentagon shapes give Magna-Tiles® Creations an all new look! Add the Magna-Tiles® Polygons Expansion Set to any Magna-Tiles® collection and explore exciting new shapes and patterns. Measures approximately: 8.00 x 2.00 x 10.00 inches..